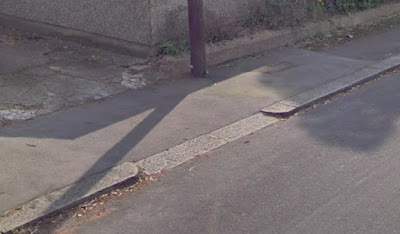 I happened to be on Google Streetview earlier in the week undertaking a virtual site visit (a wonderful tool to use from the comfort of the office) where I came across an interesting little granite kerb detail. I reckon it was an original installation, because the garage it serves is of the right vintage for the estate. Back in the day, dropped kerbs for driveways were quite an unusual street feature because there were few cars around and the dropped kerbs around the rest of the estate are almost certainly more recent. In terms of housing style, it may also be that the house served by the driveway predates many of the others. So why did it catch my eye? Well put simply, the footway is kept at a constant crossfall as it passes the driveway rather than having a dip or steeper crossfall which is so often the case. It also shows thought and a high level of craftship. The 'dropped' part of the kerb line is actually tilted towards the carriageway and the kerbs flanking it are rounded to avoid a tyre-bursting point. Keeping the crossfall of the footway constant makes walking more comfortable than having to keep negotiating dips or steeper crossfalls and this especially helps people using mobility scooters and wheelchairs as well as people pushing prams. The layout also raises another point and that's about wheelchair users wanting to cross the road away from junctions. 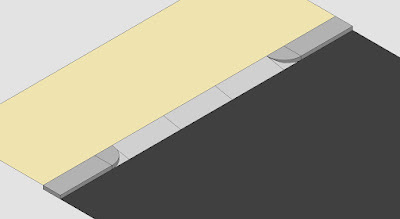 Inclusive Mobility recommends that ramps are no steeper than 1 in 20 or 1 in 12 at the steepest and even that is going to be difficult for some manual wheelchair users. However, vehicle crossings almost always get installed with an upstand of about 25mm which is no good for the front wheels of a manual wheelchair and many powerchairs. With a very short slope of 1 in 5 (over the width of a kerb), I wonder if this is more useful for incidental crossing of the road for wheelchair users than a 'traditional' (in fact modern) approach to vehicle crossing and perhaps there is a wider issue about the fact that we provide pedestrian dropped kerbs at junctions, but rarely provide any along streets, unless a more formal pedestrian crossing is provided. In side roads, it is almost always going to be vehicle crossings for informal crossing and so I would be interested in the view of wheelchair and mobility scooter users - perhaps this an an area which needs a lot more research? The normal mesures are 600mm wide, 120mm high, so a slope of 1 in 5. Benefits: pedestrians and cyclist stay on the same level; cars from the side roads have to slow down (the have to give way). Disadvantage: sometimes difficult for wheelchairs (as you mentioned. Thanks very much! Yes, I think it was more common in the UK some years ago, but then we got a little lazy. I have seen the Dutch approach, but wasn't quite sure on gradient, but thanks for the details - I have had some wheelchair uses saying that 1 in 5 over a very short distance is doable.